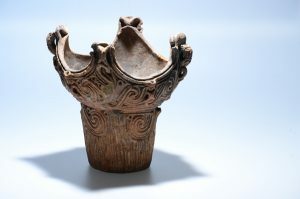 Crown type pot. Middle Jōmon period, about 3000BC, earthenware. Two spectacular Japanese prehistoric pots dating from the Middle Jōmon period (3500-2500 BCE) will shortly go on display as part of the Asahi Shimbun Displays in Room 3. The rare loans from the Niigata Municipal Science Museum consist of a ‘flame’ and ‘crown’ pot which will be exhibited alongside the British Museum’s own example of a Jōmon pot which featured in the series A History of the World in 100 Objects. To mark this unique collaboration between the British Museum and Niigata Prefecture, another flame pot is currently on display in the Ancient Japan section of the BM’s display Japan from prehistory to the present, in the Mitsubishi Corporation Japanese Galleries (Rooms 92-94). 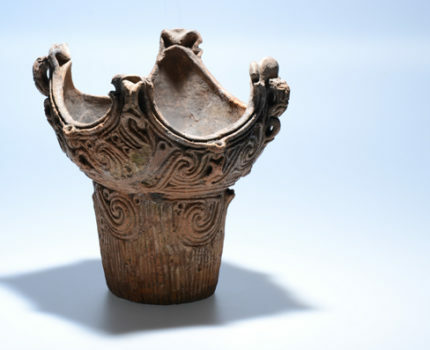 The pot dates to 3,000 BCE and is from the Dōdaira site, Tsunan city, Niigata. This is the first time that a Japanese flame pot has been sent overseas on long term loan. To mark the special exhibition at the British Museum of some of the most spectacular pottery vessels from the ancient world, Professor Tatsuo Kobayashi gave a special lecture at the Japan Foundation.